With all of the chemicals being dumped into our waterways, the laws are changing more and more as to what can be applied to lawns. We all need to think about organic solutions for our lawn problems. Did you know there are competitively priced effective organic solutions for almost all of our lawn problems? Everything from fertilizer, lime, fungicides, insecticides, thatch remover, soil enhancers and weed killers. The first step to having a delightful, lush, full lawn is prevention. Early spring is the best time to apply soil enhancers, pre-emergent weed killers, fertilizers, lime and insecticides. 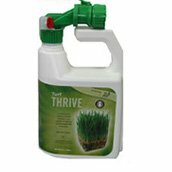 One of the great organic products is the liquid thatch remover. This product takes the drudgery out of raking out the previous year’s debris from your lawn. If you have never tried our liquid Thatch it certainly makes this chore much easier. The better the soil, the better your lawn will perform and look. It is important to have your soil pH in correct range so your plants thrive. The soil pH should be between 6.0 and 7.0. The ph can be altered if needed by using lime, such as our Cafe Lime if the soil pH is below a 6.0 and sulfur if it is above 7.0. Most of us fight weeds all summer long. One of the best defenses against the weeds is using a pre-emergent to kill the weed seed before the plants even show. Our Gluten 8 is a good organic pre-emergent. Gluten 8 is made from the nontoxic byproduct of corn processing and becomes more and more effective with continued use. Applying an organic fungicide before you see signs of fungus or disease is the best way to prevent these from forming in your lawn. There are also organic products used to kill those unwanted insects, such as fleas, ticks, chinch bugs, ants, mites, etc. Many lawns also suffer from the damage of moles & voles. Did you know we offer a Mole & Vole Repellant to keep these pest away?